Professor Douglass received his BS in Physics from the University of Maine and his PhD in Physics from the Massachusetts Institute of Technology. After positions at MIT Lincoln Laboratories and MIT, he was appointed Assistant Professor of Physics at the University of Chicago. At Chicago, he was promoted to Associate Professor and Professor. Professor Douglass joined the University of Rochester as a Professor of Physics in 1968. Professor Douglass was a recipient of the Alfred P. Sloan Award (junior) for four years, the Alfred P. Sloan Award (senior), and the University of Rochester's Bridging Fellowship to the Eastman School of Music. He is a Fellow of the American Physical Society. Professor Douglass interests have been in the general area of experimental condensed matter physics. 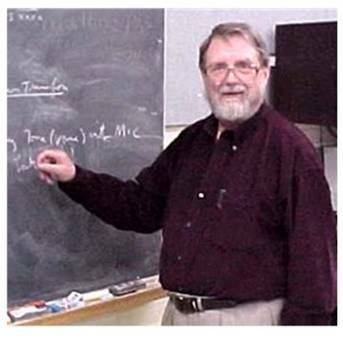 His work has involved experiments in the areas of liquid helium and superconductivity (both low temperature and high temperature). Significant contributions have also been made in the field of gravitational wave detectors. Professor Douglass has also worked on chaos and frequency drifts of spectral lines of extended sources. His interests for the last several years have been on climate change, in particular with the fundamental science issues underlying "global warming". For further details, go to Professor Douglass' home page at: http://www.pas.rochester.edu/~douglass.